Gibbons & Williams issued 30 Shilling, £1, £3, £5, and £10 notes. Their notes were among the more attractive of the period, also being printed on both sides. 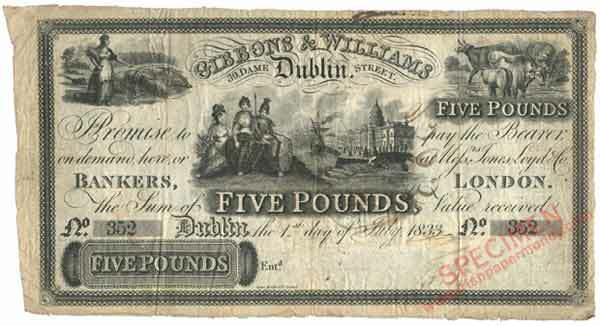 30 Shilling £1and £3 notes were payable in Dublin only, with £5 and £10 notes being payable in London also. The bank failed in 1835. Denominations: 30/-, £1, £3, £5, £10. As far as I know, there are no denominations higher than £10 known. The printed area on all the notes was the same. 200mm x 105mm. A Gibbons & Williams £5 note 1833. Gibbons & Williams £5, dated 1 September 1833. Interesting to see that two variants of the £1 note are known. Photos attached. The Gibbons & Williams £10 note is one that isn't seen too often. This one is cut-cancelled, but carefully reassembled for collectors. 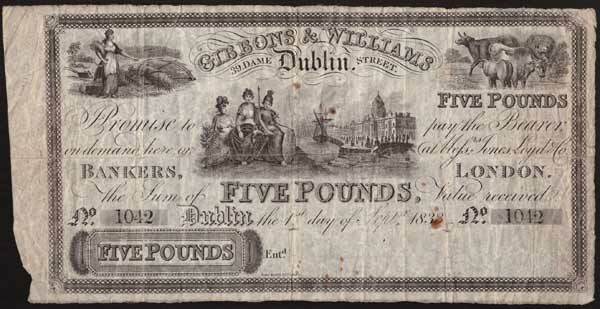 Thirty Shilling notes & Three Pound notes were both among the most common denominations issued by Irish banks up to 1844, when 30 shilling notes were prohibited. £3 notes continued to be issued up to 1915. Here is the second type of 30 Shilling note for this bank. I like the notes of this bank. It will be the first Private Bank to get its own page in the main web site! Are there 2 different designs for the 3 pound and 5 pound notes? Good question. It is entirely possible that there are two types of £3 and £5 note. The Type 1 £1 and 30 Shilling notes are dated 1st July 1833. If there are £3 and £5 notes of this date, they may have a design different to that of the later dates. It would be interesting to see if anyone has a £3 or £5 dated 1st July 1833 so we could check this out. Here is a £5 note dated 1st July 1833. A definite pattern in emerging here, but only in the dates used. this £5 note is the same design as the one above, with the later date of 1st Sept 1833. Interesting to see that the 1st July 1833 £5 note has a similar design to the later dates. This strongly suggests that there is only one type for the £5 notes. Given the low issue numbers for the £10 notes, there is most likely only one type for the £10 notes also (No.99 is the highest number I have seen, see attached). However, it would still be interesting to see a £3 note dated 1st July 1833 to confirm if there is just one type for this denomination also. Had another look at the £5 notes. There appears to be a difference between the note dated 1st July 1833 and the later dates. The 'Five Pounds' centre and top right is hollow for the early date but shaded for the later dates. Yes, you're right. That's definitely a difference between the 2 fivers. So the tenners probably have a difference too, if a later date is seen. I guess the £3 notes will be different as well. That £10 note above, No.99, is the highest number I have seen for the tenners. Below is a scan of £3 note number 5485, 4th Dec 1834, which seems to me to be the same design as the 1 sept 1833 notes. 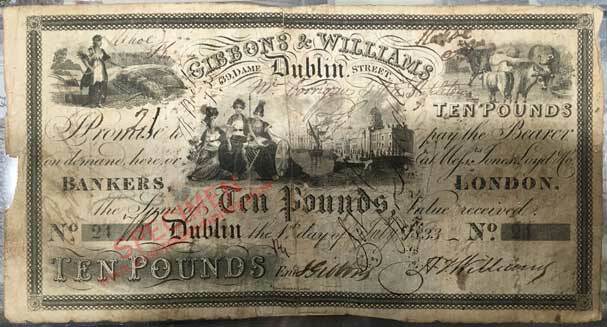 Gibbons & williams Three Pounds 4th Dec 1834. Not looking good for ther 3 pounders then! Probably not, given the date on the note above. I am still hopeful that there is a second £3 note type It would be interesting to see a £3 note dated 1st July 1833. The earliest date I have seen so far is 1st Sept. 1833. A second £10 type is possible if a date later than 1st July 1833 was issued. Maybe there's a 3 pound proof of an earlier design out there somewhere. It kinda fits that there would be 2 types for it too. Here is an interesting Gibbons & Williams fiver. It appears to have 'Johnstown' written across the signature panel—I have no idea what meaning that could have. This is also the highest serial number I have seen for the £5 denomination.